Get a full rundown of events and activities happening at the 115thAnniversary Celebration in Milwaukee. 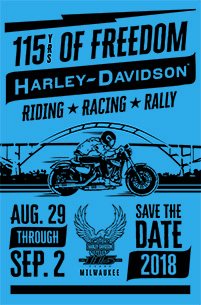 H-D of Madison will be a lunch stop on Tuesday, August 28 on the Northwest RIDES HOME. Visit the historic site of the first Harley-Davidson factory with free photo opportunities. Experience a 2019 Harley-Davidson motorcycle on the indoor Harley-Davidson JUMPSTART™Rider Experience.